W. Chan Kim and Renée Mauborgne are Professors of Strategy at INSEAD, one of the world’s top business schools, and co-directors of the INSEAD Blue Ocean Strategy Institute in Fontainebleau, France. For ten straight years, Kim and Mauborgne have been ranked in the top five management gurus in the world by Thinkers50. They are the authors of the 3.6 million copy international bestseller Blue Ocean Strategy which is recognized as one of the most iconic and impactful strategy books ever written, and the New York Times, #1 Wall Street Journal, USA Today, and Los Angeles Times Bestseller Blue Ocean Shift: Beyond Competing – Proven Steps to Inspire Confidence and Seize New Growth. Blue Ocean Strategy, which is published in 46 languages, has hit more than 300 bestseller lists across the globe and has received numerous distinguished awards from the Nobels Colloquia Prize for Leadership on Business and Economic Thinking to Fast Company’s Hall of Fame. The Financial Times called it “one of the bestselling business books of the century”. In less than a year since its publishing, Blue Ocean Shift is already a global bestseller and being translated into 30 languages. It is the winner of the “Best Strategy and Leadership book 2017” by 800-CEO-READ, “Best Business and Leadership Books of 2017” by Amazon, with Apple iBooks calling it “one of the biggest books of the year”. To date, Blue Ocean Strategy and Blue Ocean Shift teaching materials have been adopted by over 2800 universities in over 100 countries across the globe. Kim and Mauborgne are ranked in the Global Top 10 Bestselling Authors at The Case Centre out of over 33,000 business professors. Kim and Mauborgne advise, consult and speak to companies and governments worldwide, and have published numerous global bestselling articles in Harvard Business Review as well as in The Academy of Management Journal, Management Science, Organization Science, Strategic Management Journal, Administrative Science Quarterly, Journal of International Business Studies, MIT Sloan Management Review, The Wall Street Journal, The New York Times, The Financial Times, among others. They are the founders of the Blue Ocean Global Network (BOGN), a global community of practice on the Blue Ocean family of concepts that they created. BOGN embraces academics, consultants, executives, and government officers. Authors of the New York Times, #1 Wall Street Journal, USA Today, and Los Angeles Times Bestseller Blue Ocean Shift: Beyond Competing – Proven Steps to Inspire Confidence and Seize New Growth (Hachette Books, September 2017). Authors of the acclaimed over 3.6 million copy bestseller, Blue Ocean Strategy, which is being published in a record-breaking 46 languages, is a bestseller across five continents, and is the recipient of numerous distinguished awards. Ranked in the top 5 management gurus in the world in the Thinkers50 listing of the World’s Top Management Gurus, a title they have held for ten straight years. Fellows of the World Economic Forum, Davos. Kim has served as a board member as well as an advisor for a number of multinational corporations in Europe, the U.S. and the Asia Pacific region. He is an advisory member for the European Union and serves as an advisor to several countries. Mauborgne served on President Barack Obama’s Board of Advisors on Historically Black Colleges and Universities (HBCUs) for the president’s two terms. Authors awarded the Carl S. Sloane Award for Excellence from the Association of Management Consulting Firms; selected for the Leadership Hall of Fame by Fast Company magazine; winners of the Eldridge Haynes Prize awarded by the Academy of International Business and the Eldridge Haynes Memorial Trust of Business International; awarded Thinkers50 Strategy Award for the best business book of the last decade; ranked in the top 5 bestselling authors in the world at the Case Centre; named among the world’s best business school professors by MBA Rankings. 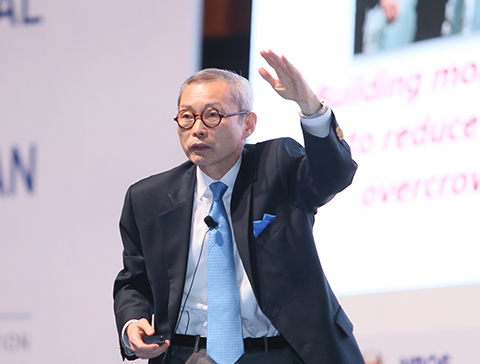 Frequent speakers at some of the world’s largest and most prestigious global and corporate events. The authors have shared the stage with former President Bill Clinton, former President George W. Bush, former Secretary of State John Kerry, former Secretary of State Colin Powell, former Vice President Al Gore, the King of Swaziland Mswati III, the Prime Minister of Thailand Prayut Chan-o-cha, Jack Welch, Rudy Giuliani, Bill Gates, former Secretary of State Henry Kissinger, Paul Krugman, film director James Cameron, Wynton Marsalis, among many others. 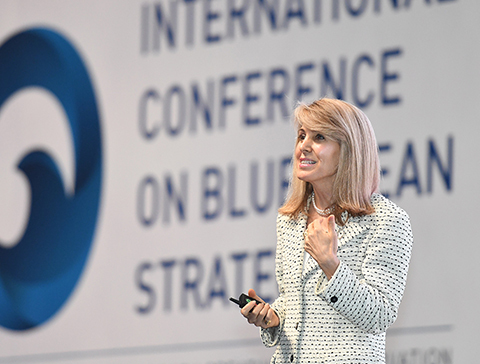 In 2016 the first ever International Conference on Blue Ocean Strategy was held. It was attended by over 5,500 global leaders from 45 countries, including Heads of State, Ministers, civil service leaders, and representative leaders from the United Nations, the Organization of Islamic Cooperation, the Association of Southeast Asian Nations (ASEAN), and member countries of the Commonwealth Association of Public Administration and Management.